It is just around the corner....and Hotelympia forms a key part of the marketing calendar for us. So we are going to be using this years to showcase the very latest in our juice and dispensing range. The first exciting news is that after listening to customer requests and feedback (yes we really do! ), we will be launching a brand new 150ml and 250ml bottle shape to feature alongside the existing Grab ‘n’ Go range. 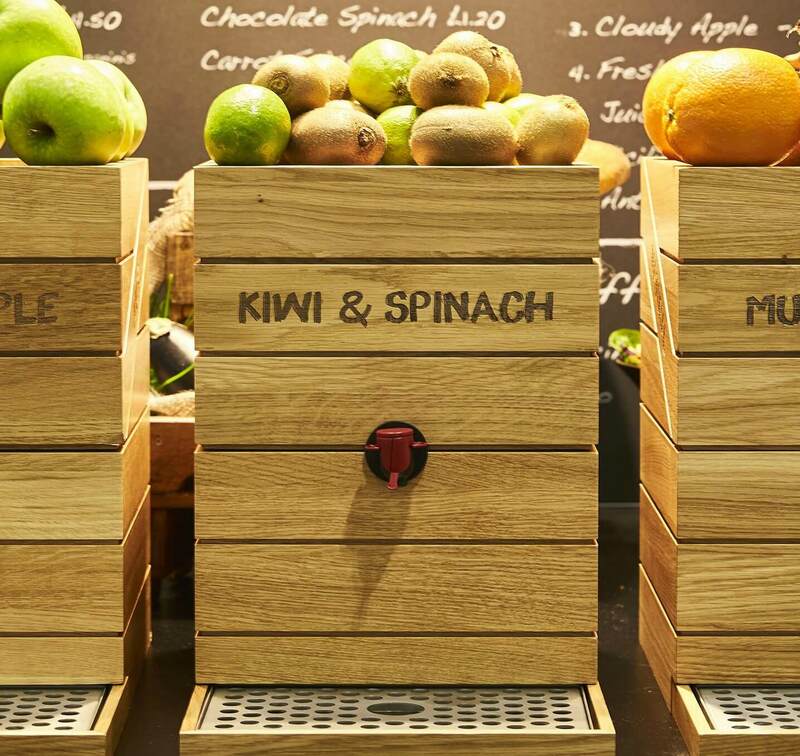 · The uniquely styled wooden crate Juice Cube with a tailored range of premium ready to drink juices, smoothies and freshly pressed cloudy lemonade. · Stylish glass dispensers, including the chilled Yorkshire with self-closing taps. Perfect for using in a wide variety of settings with any of the juice and smoothie drinks. All benefiting from no preservatives, colorants, artificial flavourings or added sugar. · The highly successful Hydration Station which can be used with all of the juices and smoothies, but also with the specially developed Hydration Juice. Featuring 21 flavours, these fruit juice drinks have only 2% sugar and are suitable for diabetics. Offering function and style, the dispensers can be displayed on copper and wooden risers or on a rustic natural wood bar. This concept also delivers great presentation opportunities with piles of fresh fruit adding to the setting and tailored POS conveying the health benefits of each flavour. · The ultimate Grab ‘n’ Go bottle concept, which delivers all the ambience of a homemade look with a quality to rival the high street, but more importantly delivers greater profit margins. Easy to manage, the 150ml or 250ml bottles are filled, safety lid locked on, label added and it is ready to serve. · Adding dynamic theatre to any hospitality environment, delicious ice blended smoothies are sure to appeal, particularly for the warmer months. Simply add the relevant amount of concentrate to ice, blend and serve. Available in two tantalising flavours bursting with fruit – Apple & Mango and Redberry, both packed with 1 of your 5 a day and with no added sugar, artificial colourings and flavourings.